Turkish Foreign Minister Mevlut Cavusoglu speaks during a news conference in Ankara, Turkey, Jan. 14, 2019. Turkey is planning to launch an international investigation into the killing of Saudi journalist Jamal Khashoggi and will take further steps in coming days, Foreign Minister Mevlut Cavusoglu was quoted as saying by state-owned media. 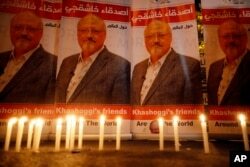 Khashoggi, a royal insider who became a critic of Saudi Arabia’s Crown Prince Mohammed bin Salman and began writing for the Washington Post after moving to the United States, was killed in the kingdom’s Istanbul consulate Oct. 2. Cavusoglu said in a speech that some Western countries were trying to cover up Khashoggi’s killing, adding that Turkey had made preparations to launch an international investigation on the matter, the state-owned Anadolu reported Monday.